Paranautical Activity is the kind of game that will likely place your Nintendo Switch, your Joy-Cons or your Pro Controller in serious danger. 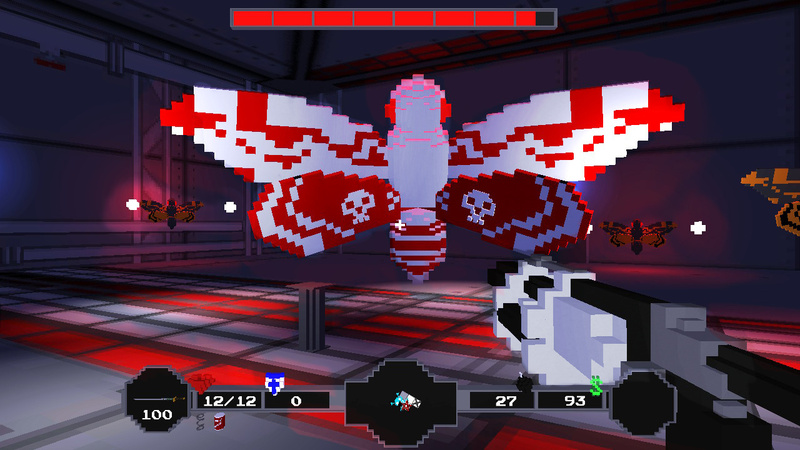 Few games can incite blood-boiling rage and white-hot fury as much as Code Avarice’s low-fi mashup of FPS mechanics and roguelike systems. You’ll have fun here and there, but you’ll mostly edge closer and closer to smashing your console to bits as its half-baked elements refuse to gel. Its blocky-pixelated aesthetic looks like the kind of thing you’d see a lonely 12-year-old building in Minecraft, while its basic dungeons and interconnected map loosely allude to the good old days of Doom. But don’t go thinking this some old school corridor shooter where running in guns-blazing will win the day. Oh no, dear reader. It might look like something from yesteryear’s gaming delights, but it plays much more like a modern roguelike. 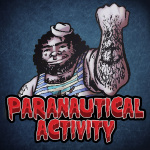 It’s a combination we’ve seen before - you only need to dial back the clock a few months to find Immortal Redneck’s similar concept shooting its way onto the Switch eShop - but unlike Crema’s enjoyable romp, Paranautical Activity struggles to find the right balance between its warring personalities. There’s nothing particularly 'wrong' with its blocky aesthetic - it actually makes some of its unusual guns, including a proper ball-firing cannon, a real ‘blast’ to use - but its randomly populated rooms and floors are so bland and boring, filled with the occasional ramp or barrel at best (or a chandelier, if you're lucky). You wonder why the developer didn’t spend the two-year gap between the Wii U and Switch versions by making its environments at least semi-interesting. It’s also an incredibly dark game, which when combined with a large number of black-coloured monsters and an imprecise aiming model and you’re left with all the precision of armed drunk running about in perpetual shadow. Maybe the overuse of darkness is meant to downplay the bland environments - whatever the reason, it makes most gunfights an exercise in luck more than anything else. Add in permadeath, and frustration soon sets in. When you’re not cloaked in shadow, the monster designs reveal themselves to be rather creative, with everything from demonic gargoyles to giant skulls spewing green fire (and spiders, naturally) in your general direction. 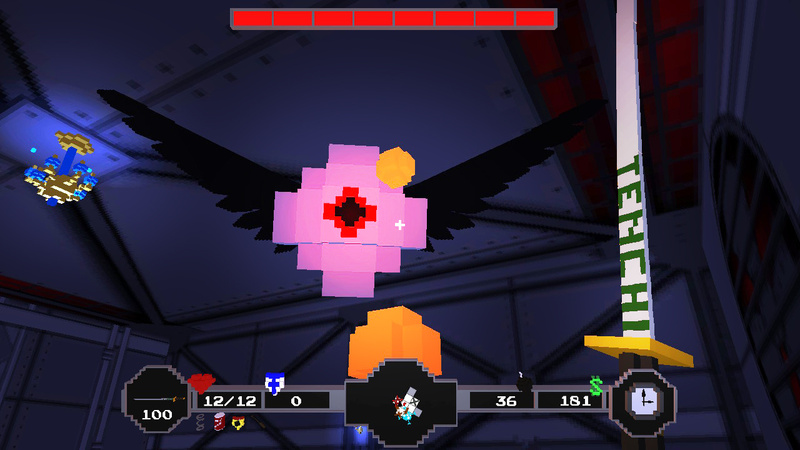 There are also some memorable boss battles, which you can only reach by clearing all the rooms on a given floor. Ever wanted to fight a giant spider with an upside-down skull for a face? Well, you’re in luck, and it’s brought some giant demons along with it. Happy days. As a roguelike, you’ll need to explore its randomly generated rooms, collect coins dropped by fallen enemies and spend that collected loot on new weapons or items that can imbue you with new powers or buffs. It's a classic template, which urges you to explore every room in order to grab enough coins for the best upgrades. It’s just a shame the game has to pause and load every room before you enter. We know its an indie title on a small scale, but it just takes you out of the heart-pumping, fast-paced action you’re meant to be engaged in. 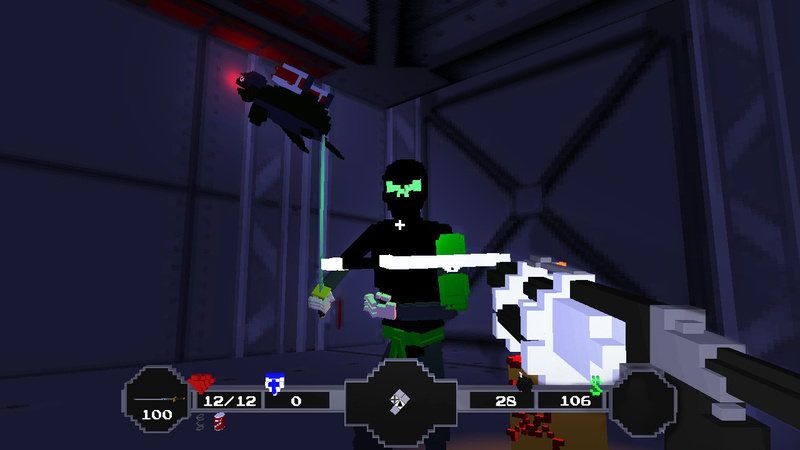 There are special power-ups, which you can unlock by completing in-game challenges - such as killing a boss with poison and leaving them to die, or clearing a room without taking a single hit of damage - but these little additions rarely help Paranautical Activity’s undercooked shooter mechanics feeling anything other slow and unresponsive. While it offers a briefly entertaining alternative to an already impressive selection of first-person shooters on Nintendo Switch, Paranautical Activity soon reveals itself to be as low-fi and forgettable as its appearance on WiI U in 2016. Even with its performance issues, the similar and far superior Immortal Redneck is a far stronger option if you want to explore roguelike dungeons through the prism of an FPS. Yikes lol, I must be in the minority here then...I’ve actually had a lot of fun messing around with this one so far! It’s not perfect by any means but once I understood what it was going to be I started to really have some fun runs within that framework. Oh well, maybe I’m just easily amused. Let's all take a moment to remember when the developer sent Gabe Newell a death threat. I think the same as the author, Immortal Redneck is well better !! I have it on PC though. @Fake-E-Lee If you have a PC, there are so many better options for this type of roguelike. Makes this one leave a bad taste. Plus the devs were... well not the best or nicest. As for switch only, I hope we get some of those better options. Immortal Redneck, that is all. @PhilKenSebben Don’t have a PC and honestly I just like it, it’s dumb, fast, and fun if you get a really good run going. I love Immortal Redneck too, just happens that I also enjoy this one! @Fake-E-Lee Brother, then enjoy it! I enjoy quite a few games many folks dont myself. If you want a good indie FPS get Immortal Redneck. I strongly disagree with this. I had a ton of fun with this game when I had it on Wii U. I had none of the problems the author apparently did. I'm just thinking someone wasn't good enough at it. @Fake-E-Lee I play it every now and again on ps4. There’s some fun to be had but I feel the difficulty comes from the wrong reasons at least in comparison to the Kings of this style. For me those are Ziggurat and Tower of Guns. Usually like in this review when the reviewers on Nintendolife say a game is frustratingly difficult, I play the game and it isn't too bad or even easy. I might check out some let's play vids. Plus I have to finish Immortal Redneck first. It would be sweet if Ziggurat came to switch. Honestly one of the worst roguelites I have ever played.